On December 16, 2010, at approximately 1736 hours, the Melbourne Police Department responded to reports of fraud at the RaceTrac gas station located at 4641 W Eau Gallie Blvd, in Melbourne (MP10-83795). An investigation revealed there was a credit card skimmer installed inside one of the fuel pumps that had been attached with Velcro. Victims began reporting fraudulent charges on their credit card accounts on December 14, 2010 and there have been fourteen (14) reports to date that are believed to be linked with this trend. At this time, it is unknown as to how long the skimmer had been inside the pump. It is estimated that over 600+ credit card numbers have been compromised. The stolen credit card numbers have been used multiple times at bank ATM’s in New York City, most frequently at the Actors Federal Credit Union. This RaceTrac station uses Gilbarco fuel pumps. It has been learned that gas stations that feature Gilbarco fuel pumps utilize universal key to make entry into the fuel pump’s face plate. It is believed that the suspect(s) obtained a dummy key to enter the fuel pump’s face plate, allowing access to the pump’s card reader. 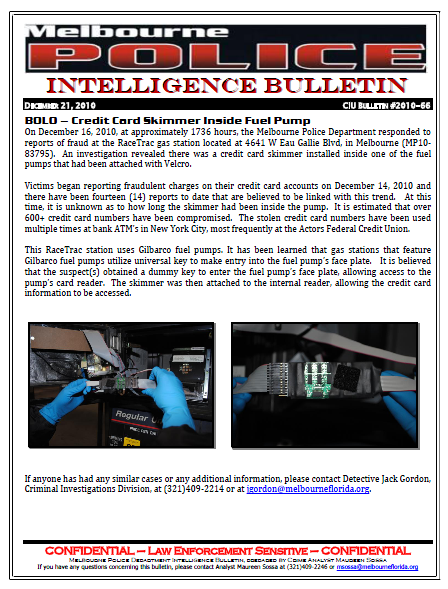 The skimmer was then attached to the internal reader, allowing the credit card information to be accessed.